Hello there folks! 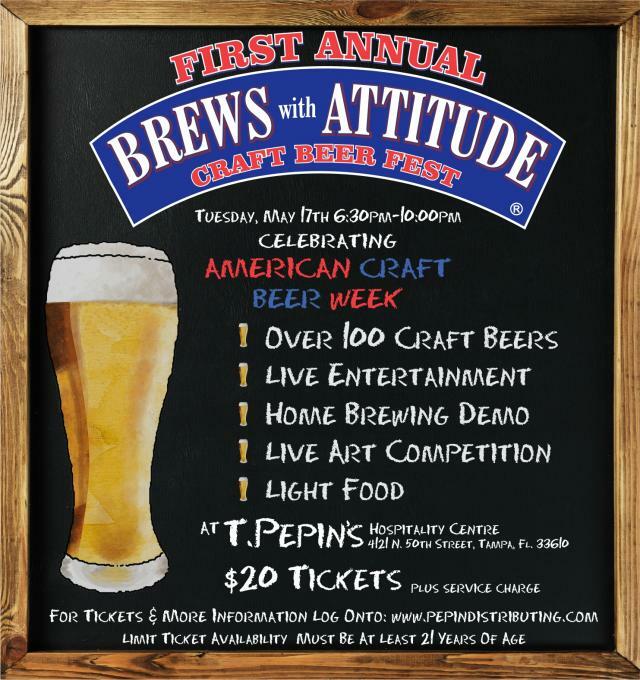 Jerm here with an update for you on an awesome event going on tomorrow sponsored in part by our friends over at Pepin Distributing at T. Pepin Hospitality Centre! Calling all of Tampa&apos;s Hop Heads!!! Join Pepin Distributing while we celebrate American Craft Beer Week: May 16th through May 22nd. - Sample over 100 Craft Brews, including a few mystery Brews not released in the State of Florida yet. Tickets are limited so be sure to hurry up and get yours! They will be playing the Tampa Bay Lightning Game on the Big Screen, come cheer on our BOLTS and drink some Beers! The Beer Brawl Competition amongst home brewers at Brews with Attitude is underway! 30 Home Brewers will be brawling for bragging rights and a gift certificate to Southern Brewing Supply. So, if you think you have what it takes get your entries in as they will only accept the first 30! That&apos;s it for now folks, but be sure to check back with us for more updates on fun things to do in Tampa Bay!